Mix the beef, pork, garlic, nutmeg, cinnamon, allspice, oregano, and breadcrumbs. Form into 15 meatballs. Cook in a small amount of oil until browned on all sides. Build the sauce around the meatballs. First remove some of the fat if there is a large amount in the bottom of the pan. Next add the onion to the pan and cook 5 minutes. Add the tomatoes, cumin, and coriander. Simmer about 20 minutes. Form the burritos. Microwave the tortilla for 20 seconds, then add 3 meatballs, some rice, chickpeas, salsa, and sour cream. Tapas have been on my mind nonstop lately. They were really trendy and popular when they first came on the scene years ago, then sort of took the back seat for a while. Recently a few new tapas restaurants popped up in Boston with the best meals I have had all year! You guys know that I love meatballs from any and all cultures, so it probably isn't a surprise that one of my favorite tapas dishes is albondigas. This week I thought of putting albondigas into a burrito. The subtle spice in albondigas was perfect, and come on – how good does a meatball burrito sound? 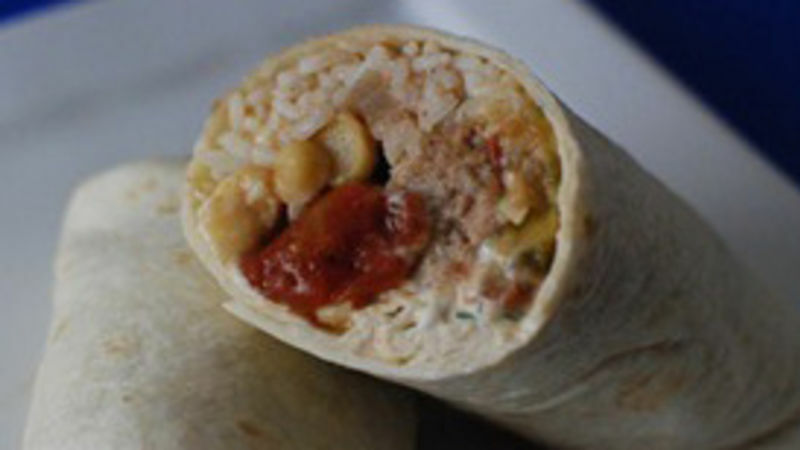 I swapped out pinto beans (my burrito fave) for chickpeas, which are common in Spanish cuisine. I made a quick salsa for this burrito. Tomatillos, tomatoes, and jalapeno in the broiler for a few minutes, then mix with raw onion, garlic, and cilantro in the blender. Feel free to use store bought. But I like to make my own sometimes. It’s quick and easy! Brown up the meatballs in a hot pan, then build the sauce around them. Very tasty, a little spice, and some unique burrito flavors and textures. Dan Whalen is very happy to have found a new vessel for eating meatballs. He has been blogging for over 3 years at The Food in my Beard; check Dan's Tablespoon profile often to try his recipes with creative international spins!